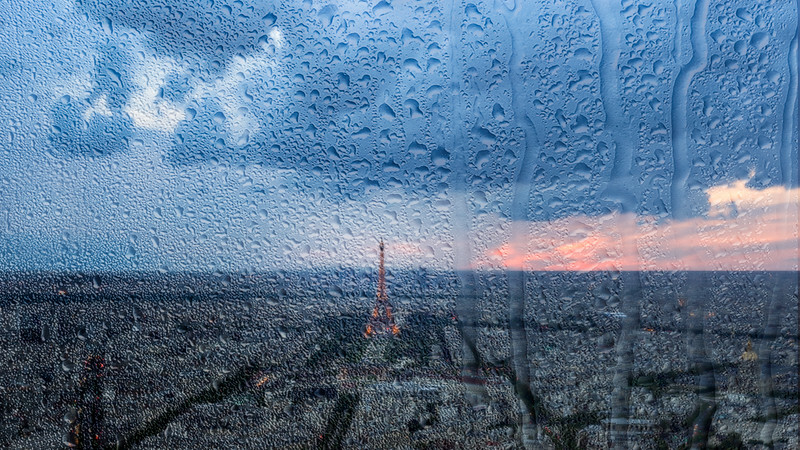 Paris is just as enchanting in the rain as centuries of writers and poets would have you believe. But for photographers chasing golden light, when the sky goes grey over "La Ville Lumiere", there are some challenges. I found myself in this situation on a recent trip with my wife. Having visited Paris before, I had already experienced all the "must do's" - this time around I wanted to focus on capturing the iconic beauty of the city. It was undeniably romantic. 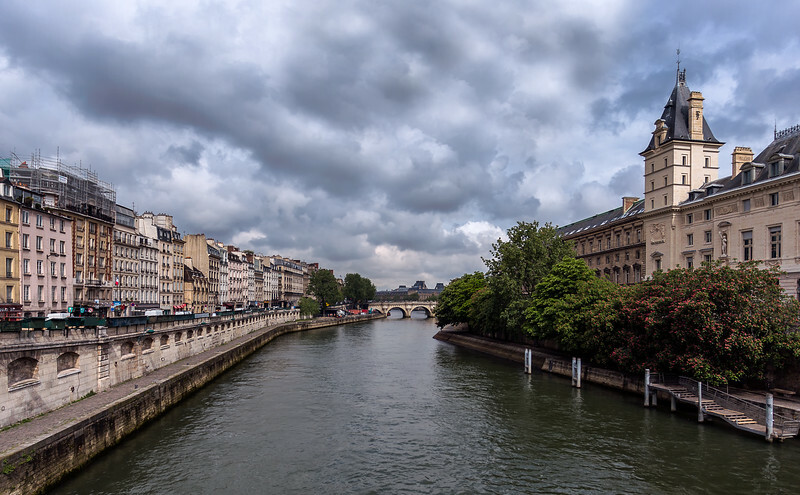 Walking arm in arm along the Seine under an umbrella and ducking into wine bars to savor a nice Cote du Rhone is definitely an idyllic way to enjoy a vacation. But my photography wheels were churning. My style of photography is best described as colorful and I don't mean in a quirky off-beat kind of way. I like bold, vibrant colors and I spend my photographic time chasing the sun. Vivd sunrises and sunsets are my passion and Paris just wasn't delivering for me. If I didn't improvise I was probably going home empty-handed. C'est la vie and all that jazz. 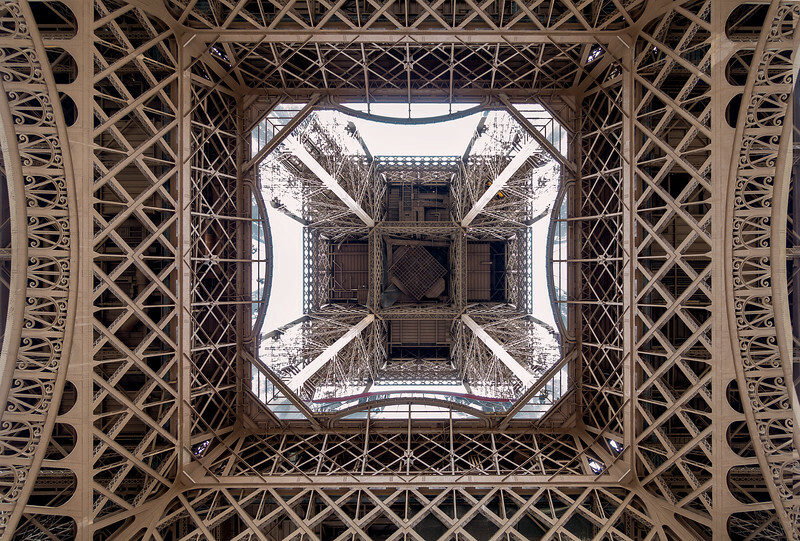 I had to get out of my camera comfort zone - more often than not, I ended up with nothing but in the process I expanded my photographic horizons and found some new vantage points from which to appreciate the wonders of Paris. Here are some of my tips for overcoming Mother Nature's frequent cruel vendettas against travel photographers to come away with indelible memories that you can frame on your wall even when conditions are anything but ideal. When times are tough for a landscape photographer (and by that of course I mean when conditions are flat and overcast), sometimes the best course of action is to intentionally blow out the sky. This breaks every rule in the book but it can be a powerful tactic. It simplifies the scene much like a high key image, narrowing the viewer's focus. 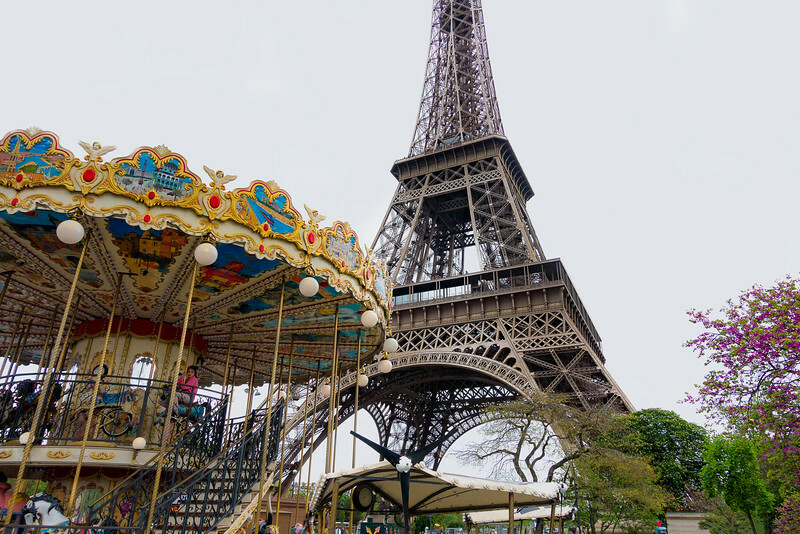 When a picnic on the Champs de Mars was washed out, we spent some time exploring the other side of the Eiffel Tower and came across a charming carousel with a lone rider - a perfect metaphor for the day! Exposing for the foreground overexposed the sky, giving it an even blueish white tone which the other elements in the image stand out well against. Simple compositions and unique angles work best with this style. It's amazing what you can get if you just point your camera straight up and look at a familiar sight from a completely different viewpoint. Blue Hour is the period of twilight every morning and evening where there is neither full daylight nor complete darkness. It is full of romance and mystery, a time when the world is in flux and possibility is just around the corner. Walking the streets of Paris after sunset, the allure of L'huere Bleue was all around me as the ambient light in the sky harmonized with the artificial lights of the city. My first Parisian Blue Hour attempt came from the Pont de la Tournelle, a terrific spot from which to photograph the flying buttresses of Notre Dame. The sky was devoid of color until after "sunset" (which I only recognized as having occurred based on the time) when right on cue a purplish blue started to emerge. Our Lady of Paris shone spectacularly against the azure backdrop. 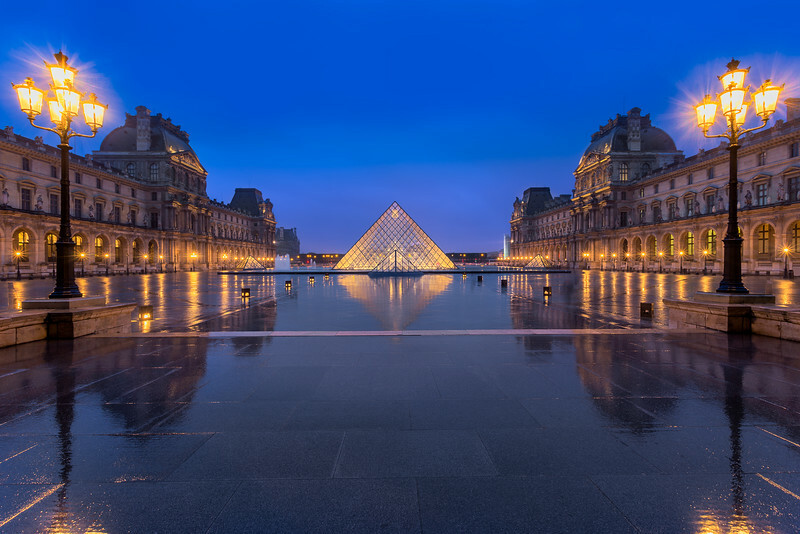 The next evening I set out for the Louvre, palace of kings and keeper of the cultural treasures of Western civilization. The sky was flat and the rain was steady. As I wandered around the courtyard scouting compositions, two benefits of the downpour made themselves clear. First I was all alone in a place that is usually teeming with people. Second, there were soft glowing water reflections everywhere just waiting to be incorporated into a picture. I found the angle I was looking for at the edge of the entrance to the Cour Carree, held my umbrella over my camera setup and started to shoot. I couldn't help but marvel at the grand scene in from of me. The warm tones in the buildings perfectly balanced the cool blues in the sky and the shimmering reflections on the ground. I couldn't leave Paris without properly photographing the Grand Old Dame herself. But as was the recurring theme of my trip, my final morning was looking dismal and I wasn't expecting much as I made the trek from our apartment in the Saint Germain area to the Jardins du Trocadero. 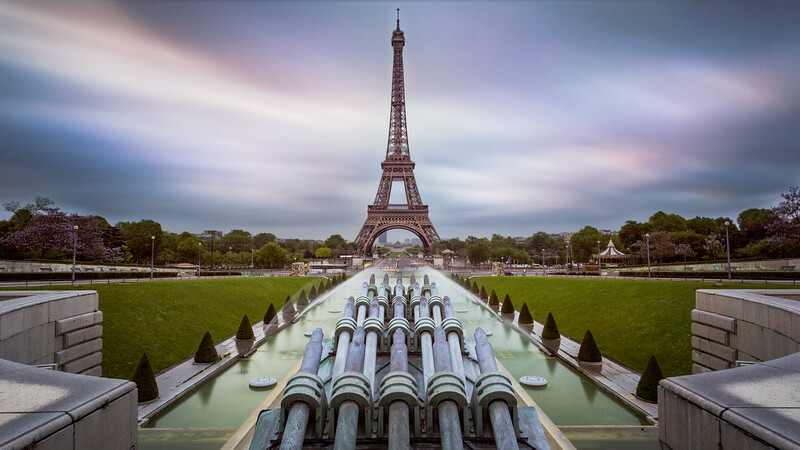 Featuring the Palais de Chaillot, an array of bronze and stone sculptures, the Fountain of Warsaw, and an unsurpassed view of the Eiffel Tower, the Trocadero Gardens are a delight to explore and if nothing else I was looking forward to enjoying them. I setup my tripod and camera at the base of the water canons and decided to shoot a long exposure. The clouds were moving and there was a hint of pink from the muted sunrise off to the left. My plan was to streak the clouds and spread the color out across the frame. I used a 10 stop ND filter (a must have for every serious landscape photographer) and set a shutter speed of 80 seconds to get the proper exposure. The end result turned a static, grey scene into a dynamic image showcasing la Tour Eiffel in all of its wrought iron majesty. On our last night in Paris, we decided to go to the top of Tour Montparnasse, a 689 foot eyesore with one redeeming quality: the best view in town. 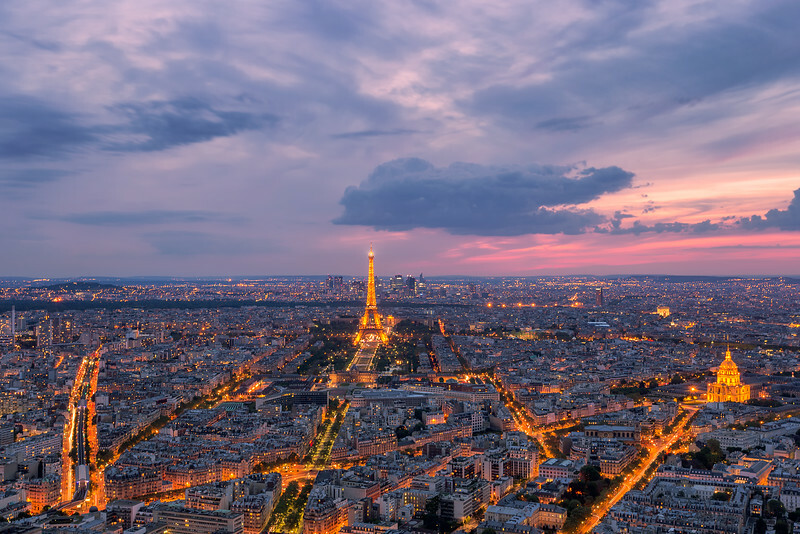 The Observation Deck offers 360 degree unobstructed views as far as the eye can see and is Paris' answer to the Shard in London. The result is breathtaking. Best of all, it's tripod friendly - a photographer's dream come true! Come early, stay late, and revel in the spectacle as the city shimmers before your eyes. We arrived in ponchos, paid our 15 Euros each (it's more than worth the price of admission), and made a beeline for a good spot. Then we waited. Even with the gloomy weather, there was a constant hive of activity as waves of people made their way onto the platform. My plan was to work on a series of moody black and white image when all of a sudden the clouds parted and the sun started to shine through. We watched in awe as a magnificent sunset unfolded over the City of Lights, a fantastic ending to a rainy but wonderful trip. There's no such thing as bad weather for photography. As travel photographers, we have to take what the weather gods deign to give us and adapt. Look for interesting or unique compositions that bring out the best in a bad scene, use Blue Hour to your advantage, incorporate filters into your work for long exposure opportunities and most importantly, be persistent. And if you ever find yourself getting poured on in Paris with no hope of a good photo opportunity - eat, drink, be merry, and enjoy one of the most beautiful cities in the world! Aneesh Kothari is a travel photographer and writer from Houston, TX. He is currently teaching himself French and wishes he could eat Pain au Chocolat on a daily basis. He can be found traveling the world with his wife, camera, and drone.